The holidays are here and it is my favorite time of year! One of my favorite things to do during the holiday season is to make things for our home that will last through the years as the kids get older. Mementoes that we can pull out year after year. Those handmade pieces are a big part of the season for me. This year, I am making our stockings. 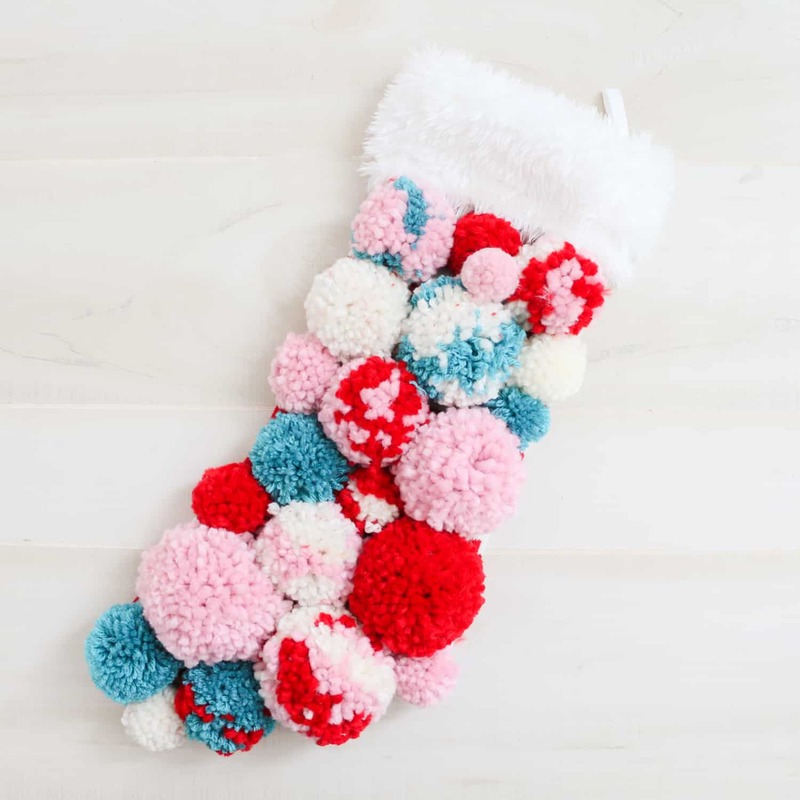 Fluffy pom pom stockings, to be exact. I love the fun texture of these stockings and that they can be customized to any holiday color scheme. I went with one of my favorite holiday color palettes of red, turquoise, white, and pink. But you can make them in your favorite! Step 1: Begin by making all the pom poms! 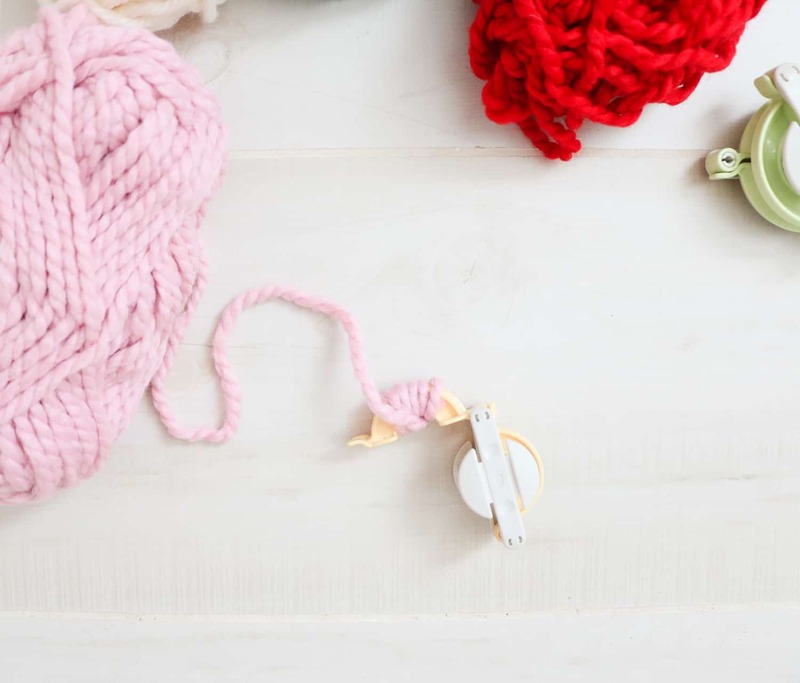 If you have never used a pom pom maker before, it is relatively simple. Just open the two side pieces and wrap the yarn around each side. 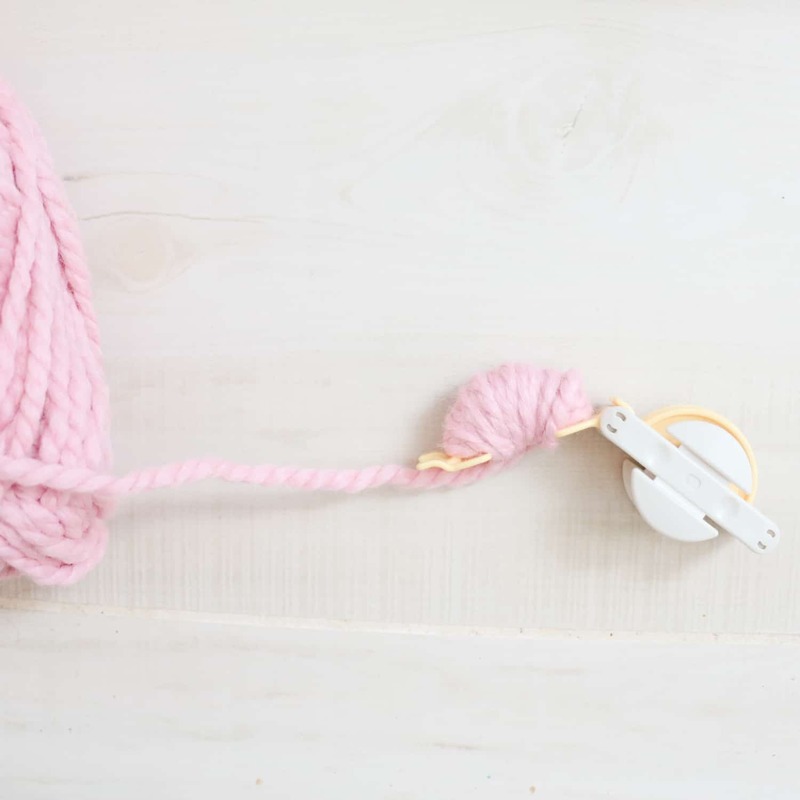 Then close the arms and snip the yarn around the outer edge of the pom pom maker. 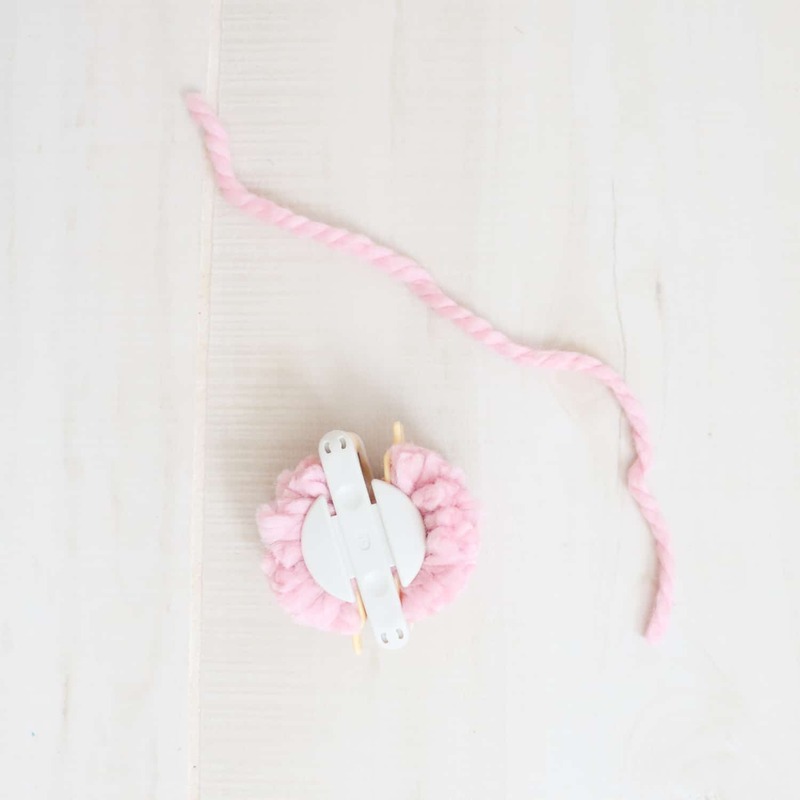 Cut a piece of 6″ yarn and tie it around the side of the pom pom maker as tight as you can in a knot. Then open the arms and pull the two sides apart to release your pom pom. 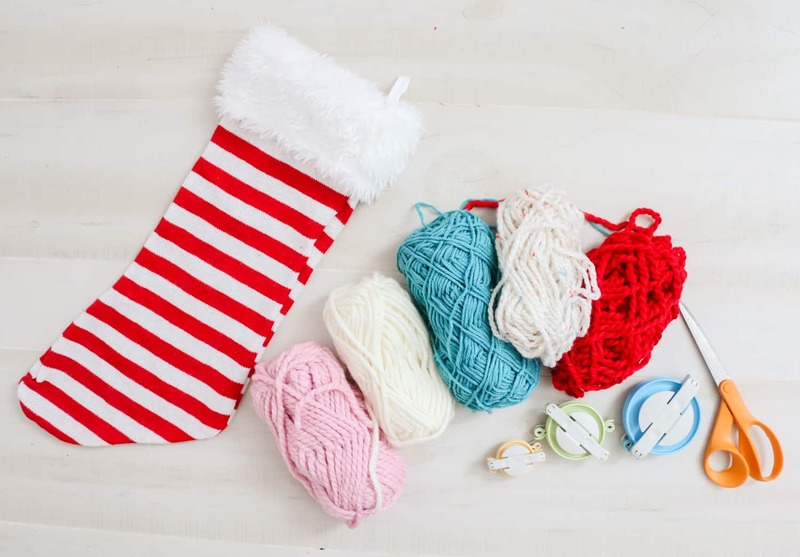 Step 2: Repeat to make enough pom poms to cover your stocking. 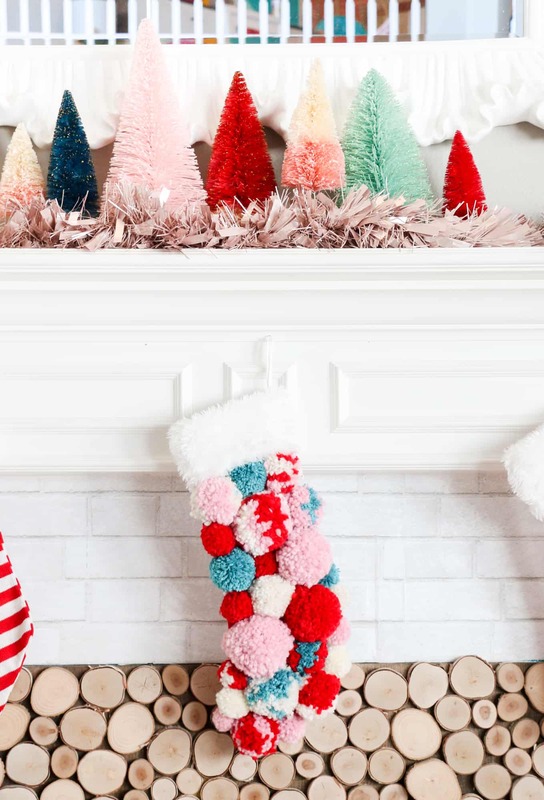 You may want to lay out the pom poms on the stocking as you go so that you can judge the sizes and colors you need. 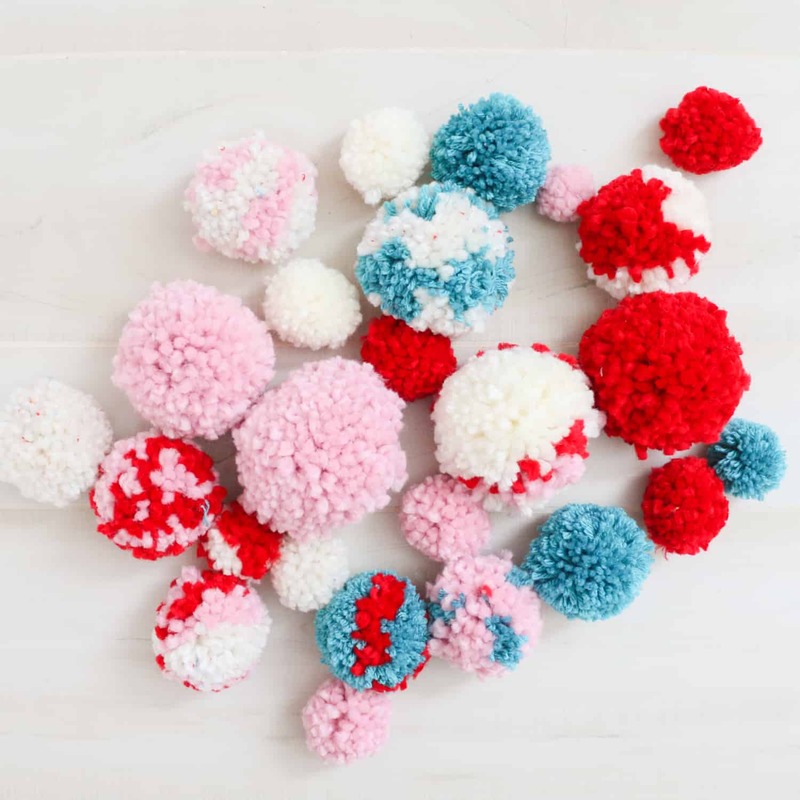 For the multicolor pom poms, just wrap the yarn in chunks of color instead of just one color when creating your pom poms. Step 3: Once all your pom poms are made, it is time to attach them to the stocking. 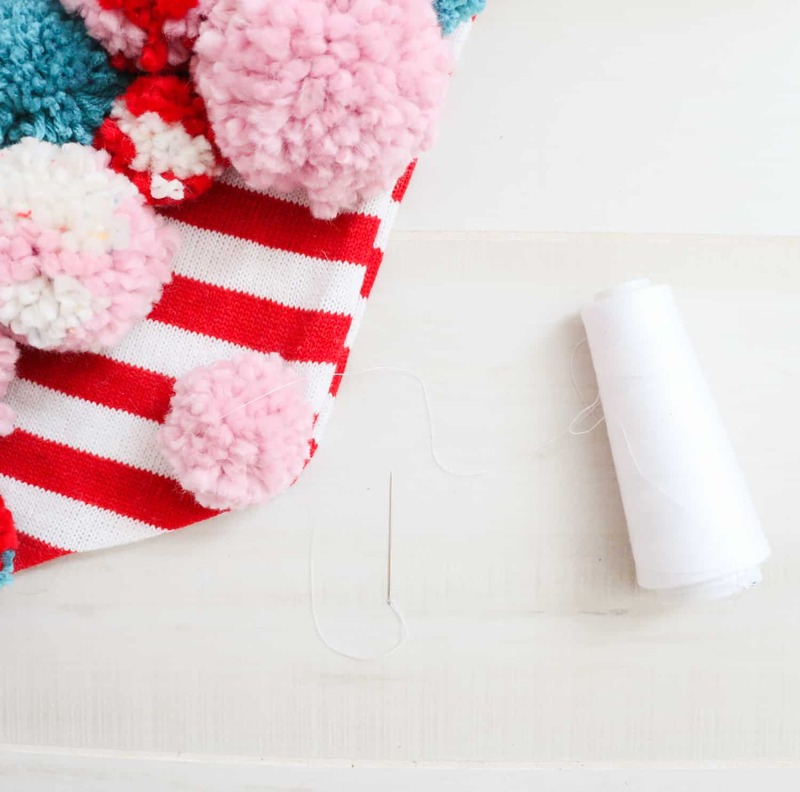 To do this, use a needle and thread to sew up through the center of the pom pom and over around the side of the pom pom and through the stocking. 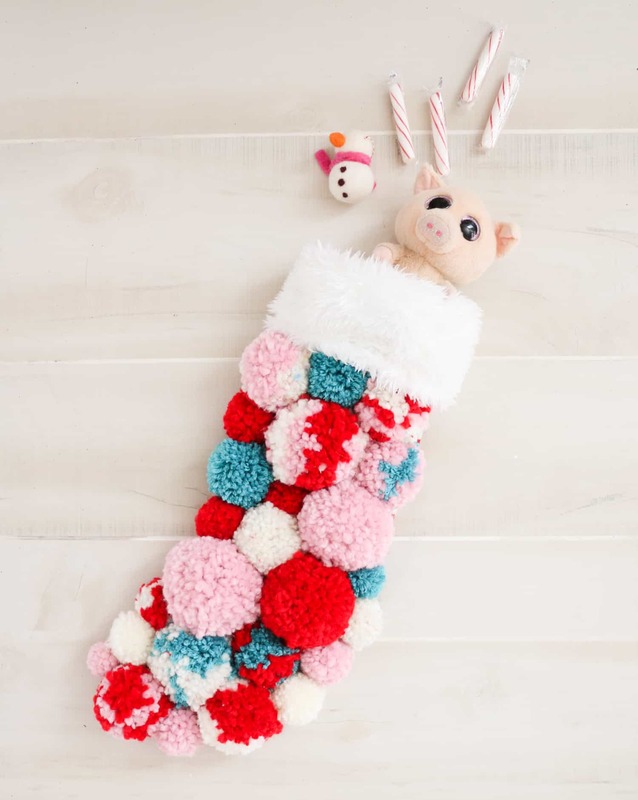 Repeat several times around all the pom pom sides to really secure it onto the stocking. Repeat with all the pom poms. You can also add permanent fabric glue to the pom poms to give them an extra hold. 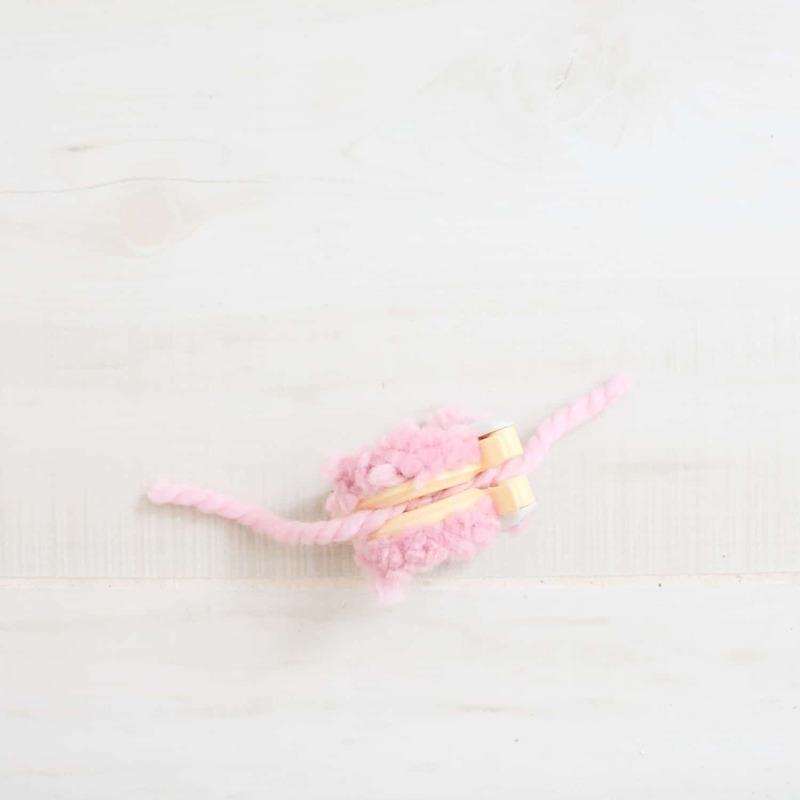 Once you have attached all your pom poms, use fabric glue to glue the pom pom sides together. 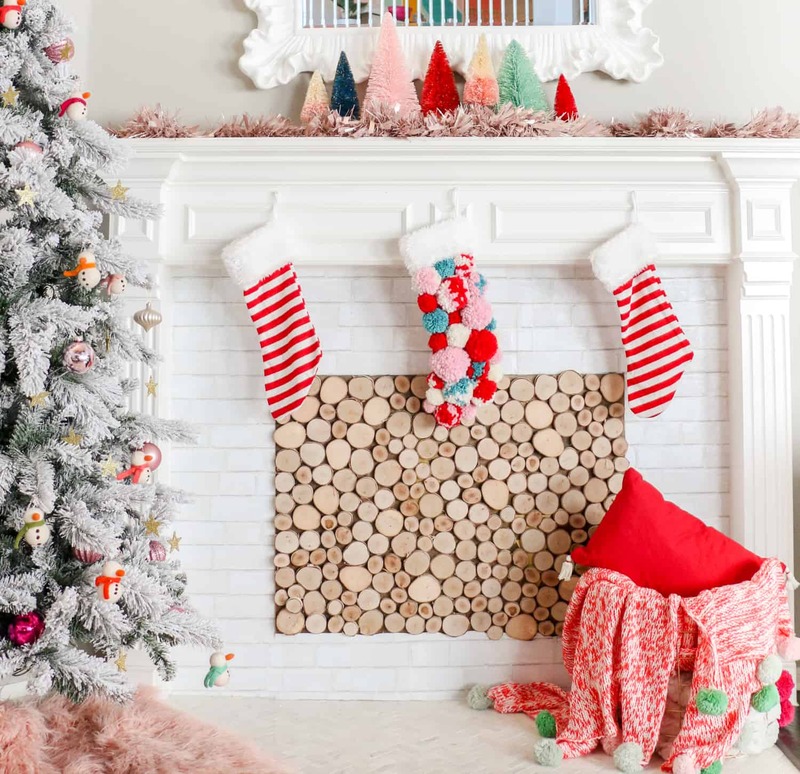 This way when you hang the stockings the pom poms hold together instead of gaping apart. Once the glue is dry, your stocking is ready to hang.